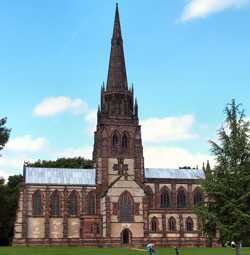 The church was built in 1886-9 by Bodley & Garner for the seventh Duke of Newcastle. The nearby Clumber House was demolished c.1938. The church imitates the Decorated style of the 14th century. 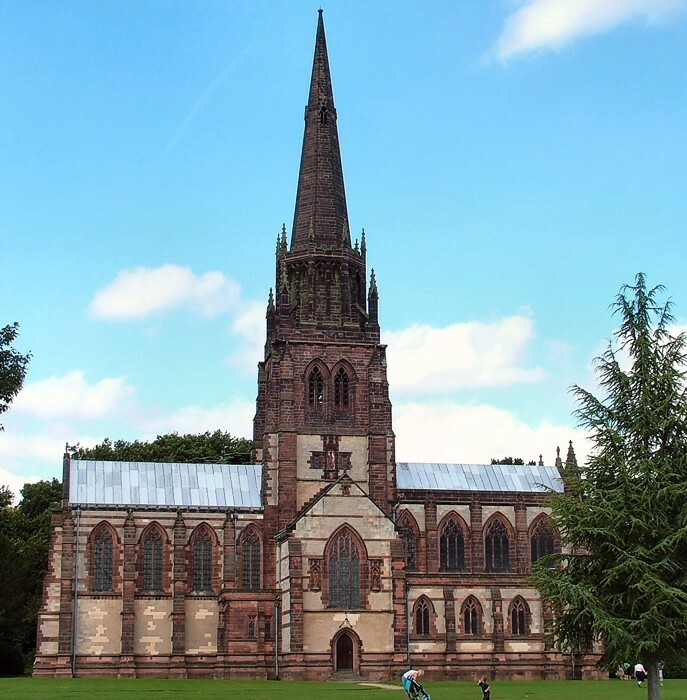 Built of red Runcorn and white Steetley stone, it consists of a choir with aisle, nave, transepts, vestries and a lofty central tower containing one bell, capped by a 180 ft spire modelled on Patrington (East Yorkshire). In the north passage is the baptistry and to the south of the chancel is the Lady Chapel. The chancel is elaborately decorated with wood carving of the rood screen, priest’s and choir stalls by the Rev Ernest Geldert. The interior stonework including the two altars, the pulpit, the font and the stone figures were designed by Bodley. The statue of the Virgin in the south aisle is by Ninian Comper. Much of the stained glass is by C Kempe. The high altar is of white alabaster. The beautifully carved lime-wood statues represent the four Evangelists, the four Doctors, the four Saints of Northern England and the four chief Archangels. The church closed when the House was demolished, but after the National Trust took over it opened again in 1954. The National Coal Board helped with major repairs in 1984-5 after mining subsidence occurred. A massive concrete raft was placed under the chancel. Bodley’s ‘cathedral in miniature’ stands in an unforgettable setting almost on its own next to the lake. and to him, Geoff Buxton and Chris Brooke for the photographs.